This morning (yes, I just did a bike ride and it's 10:15 AM) I'm drinking Laughing Skull Amber Ale brewed by Atlanta Brewing Company in Atlanta, Georgia. The label goes out of its way to make sure you know these are also the makers of the Red Brick beers. 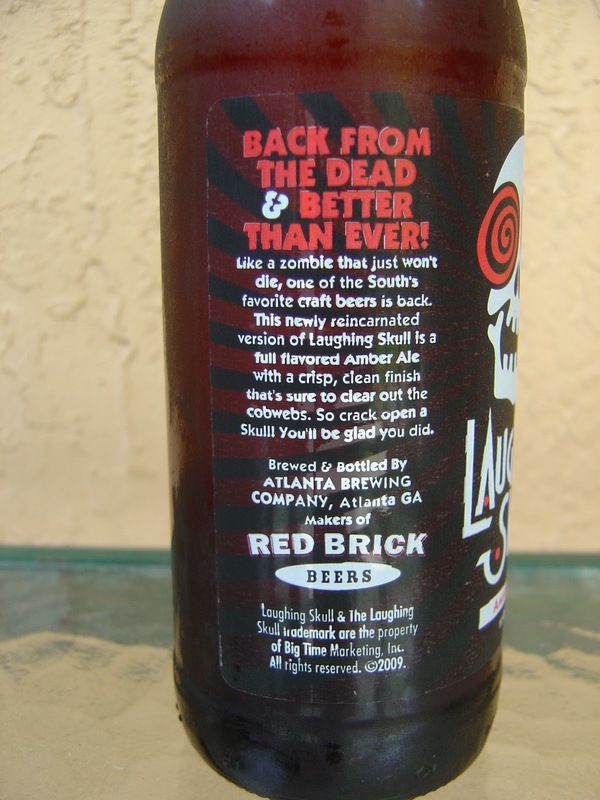 From the story, it seems this beer disappeared and then came "BACK FROM THE DEAD". 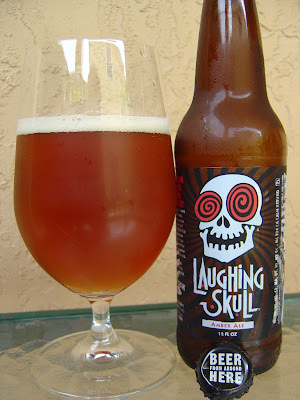 Until recently, this brewery's beers were unavailable in South Florida. The label art is fun and matches the beer name. There's an expiration date stamped on the neck 06/04/11. Caramel, grainy sweet aroma. Ditto on the initial flavors. Sweet grain, caramel, bread and even a bit of nuts. The nuttiness is actually the lingering flavor after each sip. Interesting. Initial sweetness is met with just the slightest of hoppy, spicy bites. Good carbonation, decent body. Average but not bad. Not particularly refreshing after my morning workout, though. Let me know what you think! Cool name, cool label, average brew.